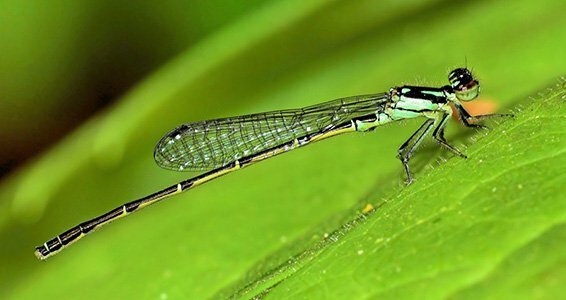 Dragonflies and damselflies are active and abundant in and near wetlands from April through November. A particularly good place to observe them is at Spring Lake. Butterflies, ground-nesting bees, and other beneficial pollinators are also common and easy to see when they are feeding at flowers such as Pickerelweed, milkweeds, goldenrods and asters. Many other invertebrates, including Crayfish, freshwater mussels, and Asiatic Clam, can also be found. Non-tidal marshes and ponds provide habitat for frogs such as Spring Peepers and Green Frogs. Their mating calls are heard especially during warm spring nights. Red-bellied, Eastern Painted, and Snapping Turtles can be found sunning on logs, plant hummocks, or near the water surface during spring and summer. Turtles travel away from water to lay eggs. Their nests, often raided by foxes or raccoons, can be found in upland areas, even at the top of the bluffs that surround the Marsh. Snakes, such as Northern Watersnakes and Ribbon Snakes, may be seen sunning themselves. None of the snakes found in the Marsh is poisonous and all are important to a healthy marsh ecosystem. 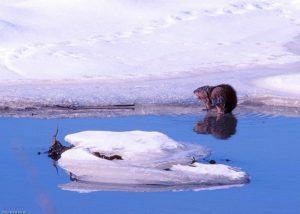 Marshes and ponds are home to Beavers and Muskrats. They build lodges for shelter, the tops of which may also be used as nest sites by Canada Geese or Mute Swans. River Otter have been seen along Crosswicks Creek and Watson’s Creek. Squirrels and Chipmunks are active during the day, but other common woodland mammals such as Raccoons, Red Foxes, and Opossums are rarely seen because of their nocturnal habits. The presence of White-footed Mice is made evident by clumps of germinating seeds that were cached by the mice as food for winter. White-tailed Deer are present, but still relatively uncommon. Although there are historical records, Boy Scouts found the first salamander on April 1, 2017. That has been added to the amphibian list. An unusual late sighting, a garter snake was found along the Bordentown Bluffs on November 3, 2018. Many other kinds of animals contribute to a diverse Marshland fauna, some so small they are invisible to the naked eye. For lists of animal species that may be seen at the Marshland, click on the appropriate link below.